1. President Donald Trump. President Trump's fiery immigration rhetoric and tough immigration enforcement policies unquestionably were the biggest immigration story in the United States in 2017. It is hard to know where to start, from the travel bans to immigration enforcement executive orders to the end of DACA to many statements and initiatives greatly increasing fear in the immigrant communities. President Trump's aggressive immigration measures might only have been topped by his tough, often caustic, immigration rhetoric. The good news is that the Trump administration's immigration measures have revitalized and inspired the immigrant rights movement. 2. The End of DACA. After months of speculation, the Trump administration, in an announcement by Attorney General Jeff Sessions, in September began the phasing out of the Deferred Action for Childhood Arrivals program, President Obama's signature immigration initiative. The future of DACA recipients was thrown into disarray. There were protests of the end of DACA across the country and many calls for congressional action to address the many deficiencies with the immigration laws. 3. The Pardon of Joe Arpaio In August, President Trump pardoned former Maricopa County (Arizona) Sheriff Joe Arpaio. After a criminal contempt trial, a U.S. district court had found Arpaio to have intentionally refused to comply with court orders that he not engage in unlawful racial profiling of Latina/os in Arizona, U.S citizens as well as immigrants. In continued violation of numerous court orders, Arpaio continued his discriminatory law enforcement practices and even had an investigator tail the wife of the district court judge who ordered the injunction. Not surprisingly, the pardon was widely criticized. 4. Chief Justice of California Criticizes ICE Operations at the California Courthouses. In March, Chief Justice of California Tani Cantil-Sakauye expressed concerns with federal immigration enforcement operations at the California courthouses in a letter to Attorney General Jeff Sessions and then-Secretary of the Department of Homeland Security John Kelly. Her specific concerns centered on "reports from some of our trial courts that immigration agents appear to be stalking undocumented immigrants in our courthouses to make arrests." California's courageous Chief Justice received a less than friendly response from the Attorney General and DHS Secretary. 5. Defense Verdict in Kate Steinle Case. The tragedy of Kate Steinle's death on the San Francisco waterfront became a front page immigration football for, among others, President Trump. In November, a San Francisco jury reached a verdict in the trial of a homeless undocumented immigrant in the fatal shooting of Steinle. The jury found for the defense on all counts but a firearms charge. The verdict provoked much discussion and debate. President Donald Trump, who had previously talked about the Steinle case as an example of why undocumented immigration was out of control, condemned the verdict. He tweeted that the not guilty verdict in the Steinle murder trial was "disgraceful." Jose Ines Garcia Zarate, a Mexican citizen who had been released from a San Francisco jail and had previously been deported many times, had been charged with murder. 6. The Supreme Court and Immigration. The Supreme Court's 2016 Term ended with a whimper in its remaining immigration cases. On the last day of the Term, the Court agreed to review the travel ban decisions in the 2017 Term (a grant that it later dismissed as moot in the wake of the issuance of a new travel ban by President Trump). The Court also decided Hernandez v. Mesa, which involved a cross border shooting by U.S. immigration enforcement officer of a young Mexican national. The Court in a per curiam opinion vacated and remanded the case to the court of appeals to consider whether the family could sue for violation of the Fourth Amendment. Last but not least, on the last day of the Term, the Court ordered reargument in two immigration cases that were re-argued in October -- Jennings v. Rodriguez (reviewing the legality of detention of immigrants without a bond hearing) and Sessions v. Dimaya (reviewing a Ninth Circuit decision, written by Judge Stephen Reinhardt, striking down a criminal removal provision as unconstitutionally vague). Justice Kagan later recused herself in the Jennings case. 1. Sessions v. Morales-Santana (invalidating gender distinctions favoring women over men based on antiquated on stereotypes in derivative citizenship laws). 2. Esquivel-Quintana v. Sessions (interpreting criminal removal provision and finding in favor of noncitizen convicted of a crime). 3. Maslenjak v.. United States (finding in favor of a U.S. citizen in a denaturalization case). 4. Lee v. United States (finding in favor if immigrant in ineffective assistance of counsel case based on erroneous advice on immigration consequences of guilty plea). 7. Sanctuary resistance. As President Trump's immigration initiatives were put into place, many state and local governments resisted and sought to protect immigrant residents. California in fact became a "sanctuary" state. The Golden State made national news when, in a rebuke to President Trump's expanded immigration enforcement measures, Governor Jerry Brown today signed "sanctuary state" legislation, vastly limiting who state and local law enforcement agencies can hold, question, and transfer at the request of federal immigration authorities. Senate Bill 54, which takes effect in January, has been hailed as part of a broader effort to protect more than 2.3 million undocumented immigrants living in the state. The law was met with swift denunciations from Trump administration officials and became the focus of a national debate over how far states and cities can go to prevent their officers from enforcing federal immigration laws. Here is my take on SB 54. A number of states, including New York, Hawaii, and others also have been resisting the Trump administration's aggressive immigration enforcement initiatives. 8. RAISE Act. Congress has debated comprehensive immigration reform for years. This summer, President Trump endorsed immigration reform in the name of the RAISE Act, S. 1720, which was introduced in the Senate by Senators Tom Cotton (R-AR) and David Perdue (R-GA). The RAISE Act would drastically reshape American immigration. The Act would cut the annual immigrant admissions by one-half by eliminating all family sponsorship beyond spouses and minor children of U.S. citizens and lawful permanent residents, and would reduce various family categories from 226,000 green cards to 88,000. The cuts to family-based immigration would reduce immigration from, among other nations, Mexico, China, and India. An analysis by the Migration Policy Institute looks critically at the RAISE Act. Besides dramatically reducing family-based immigration, the RAISE Act would replace the current selection scheme with a points system in which applicants would earn points based on "merit." The bill also seeks to eliminate the Diversity Visa program and further caps refugee admissions, cutting back lawful immigration by 100,000 a year. In total, the RAISE Act would lead to an overall reduction of legal immigration by 50 percent over the next decade. That would exacerbate the current problem of undocumented immigration. 9. Human Trafficking Deaths in San Antonio. News in July of a tragedy in Texas offered a frightening glimpse of the horrors of modern human trafficking. Outside a San Antonio Walmart morning, authorities found eight bodies and 30 undocumented immigrants in the trailer of a truck. The victims of trafficking were severely injured from overheating inside. A ninth person later died in hospital. A federal complaint was filed alleging that James Matthew Bradley Jr. unlawfully transported aliens in violation of law resulting in the deaths. Upon conviction, the offense is punishable by life imprisonment or death, a $250,000 fine, and three years of supervised release. Despite increased border enforcement, the smuggling of migrants into the United States continues to be a problem and a lucrative enterprise for some. For many years, death on the border (and here and here) as migrants attempt to make the journey to the United States have been commonplace. Increased immigration enforcement measures have re-routed migrants through deserts and mountains where migrants are more likely to die. Human smuggling has grown as a business enterprise. 10. A Family Slave? In a gripping family story, Alex Tizon, who passed away this past March, wrote in The Atlantic about his "family's slave," Lola, who was brought to the United States from the Philippines. Tizon tells about Eudocia Tomas Pulido called "Lola," who his mother inherited from her father. Lola, a modern-day slave, worked as a domestic servant. As reported in one news story: "The article drew mixed reactions, with some labeling him complicit to the abuse of Lola-how was it allowed to go on for so long? 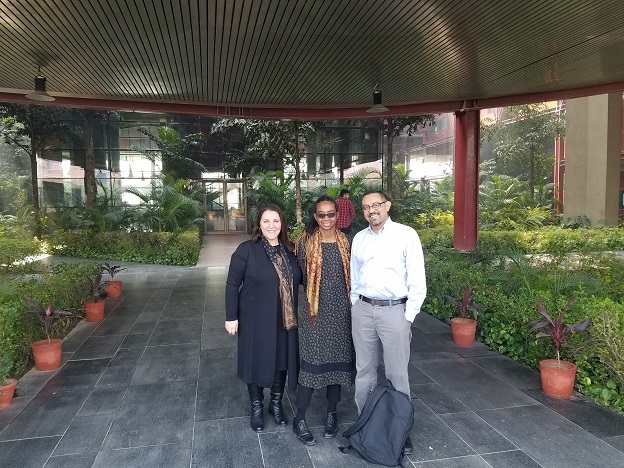 Others acknowledged that the story was neither about glorification nor justification, but to give Lola the voice she was made to feel she never deserved. . . ."
From left to right: Professor Afra Afsharipour, Professor Angela Harris, and Professor Ashutosh Bhagwat. UC Davis School of Law and Jindal Global Law School hosted a joint conference on "Law, Institutions, and Justice: Understanding the Roles and Responsibilities of 'Public' and 'Private' Institutions in Policymaking and Governance" at Jindal Global Law School on December 2 in Sonipat, India. This was the first in a series of interdisciplinary conferences bringing together scholars from the U.S. and India to engage in explorations of issues related to democratic institutions and the quest to ensure social, economic, and political justice. The second decade of the 21st century has brought challenges to the three pillars of liberalism - institutions, integrity, and rights. The conference created a scholarly conversation about these challenges and how best to respond to them. UC Davis School of Law presenters included Professors Afra Afsharipour, Angela Harris, Ashutosh Bhagwat, and Peter Lee. Jindal Global Law School Professors Avirup Bose and Suvrajyoti Gupta also made presentations, as did a number of other distinguished Jindal Global University scholars. The conference was part of a partnership between Jindal Global Law School and UC Davis that was formed almost five years ago. In addition to faculty and student exchanges, the law schools have plans for additional academic forums on timely legal issues featuring cross-disciplinary perspectives. "We are honored to work with our distinguished Jindal Global University colleagues to explore timely issues, and we are especially excited about the deepening relationship between UC Davis School of Law and Jindal Global Law School as we expand our portfolio of partnership activities," said Beth Greenwood, Associate Dean for International Programs at UC Davis School of Law. "This visit, led by Professor Afsharipour, presented an opportunity to plan future joint interdisciplinary conferences and other innovative initiatives. We would especially like to thank our Jindal Global Law School colleagues and Vice Chancellor Dr. Raj Kumar and Dean Kevin Johnson for making this joint conference possible." For further information, please contact Concha Romero at cromero@ucdavis.edu or at 530-752-9043. 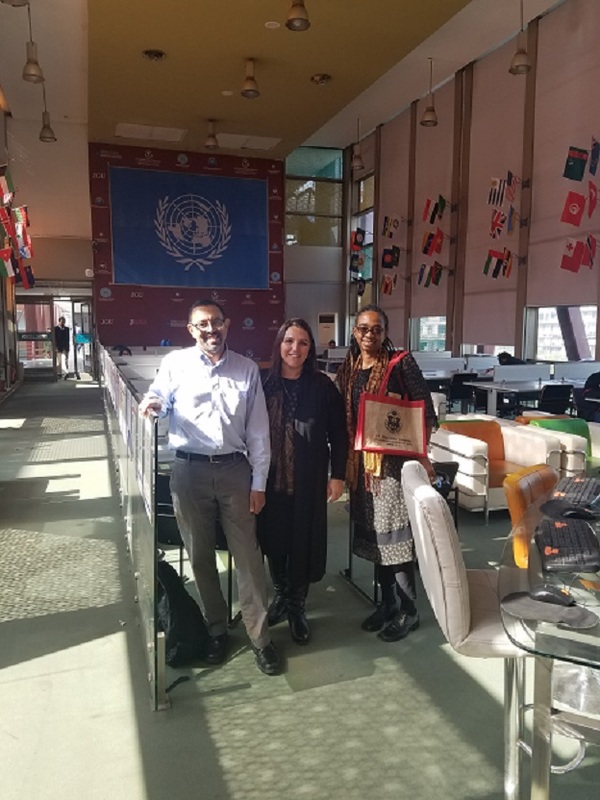 From left to right: Professor Ashutosh Bhagwat, Professor Afra Afsharipour, and Professor Angela Harris. 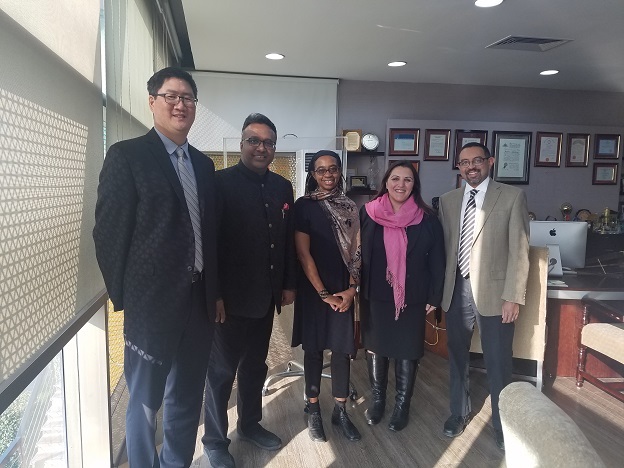 From left to right: Professor Peter Lee, Jindal Global Law School Vice Chancellor Dr. Raj Kumar, Professor Angela Harris, Professor Afra Afsharipour, and Professor Ashutosh Bhagwat. The tax reform plan that just passed the House of Representatives repeals the SALT deduction, except for $10,000 in property taxes. The Senate plan would repeal the deduction outright, though there appears to be a chance that the final Senate bill will move closer to the House position. Numerous commentators have weighed in on both plans and, in general, the consensus is that neither plan is very well conceived. There are at least three main lines of criticism, all of which I largely agree with. First, per Daniel Hemel (and many others), on basic income tax principles there is a sound argument that some portion of the deduction should be maintained for individuals because these taxes do not pay for personal consumption, and so the Senate plan simply fails on that ground. There is also a good argument that the deduction is justified for businesses, though note that retaining the deduction for businesses but eliminating it for individuals leads to incentives for individuals to take the SALT deduction at the business level. Perhaps, as David Kamin explains, this problem has now been addressed, though, as he also notes, the current legislation does not take into account numerous possible responses by the states to eliminating the individual deduction. Second, as to which set of taxes - state or local - have the better claim to be retained as a deduction on income tax principle, the better argument is for state income taxes and not property taxes, which are typically local. This is because, as Gladriel Shobe has argued here and here, there is a stronger argument that local property taxes are prices paid to consume local amenities rather than state level taxes. The House proposal therefore gets matters backwards from an income tax principle (and distributive) perspective. A third important critique is to note that eliminating the deduction, when combined with other aspects of the Republican plans, amounts to a tax increase specifically targeted to certain parts of the country. This is just not good for our polity. But can anything positive be said about this? I can almost make an argument in favor of the House approach as to the property tax. That I can't in the end illustrates, in yet another way, the incoherence and meanness of these proposals. Back in 2012, I argued that there was a good argument for the federal government to repeal the SALT deduction except for the property tax component. My argument was not based on income tax principles, but on the proper role of the central government in a federation. One of those roles is maintaining stability and generally optimizing the revenue system of all of the component governments. It is axiomatic that the property tax is a relatively efficient tax that should be assigned to local governments to finance local public goods. The forty years since California's Proposition 13 has also made it clear that states and localities were reducing their reliance on the property tax - in part because of the liquidity problems commonly associated with the tax. There was therefore, I thought, a good argument that the federal government should intervene to make the property tax relatively cheaper so as to nudge its continued - or even increased - use. The current House proposal bears some resemblance to what I had in mind and yet I still think the House proposal is not a good idea. Why? For one thing, from the perspective of 2017 I realize that my argument missed at least two big points. First, my underlying assumption was that the federal government would be continuing to carry out another of its key roles - redistribution. Eliminating the SALT deduction in order, in part, to pay for the ACA, or at least prevent cuts to the ACA and other social insurance programs, seemed reasonable distribution-wise in 2012. Indeed, I argued that encouraging the use of the relatively stable property tax actually benefits the less well-off precisely because, as David Gamage has shown, they are the ones most likely to suffer from sharp state and local budget cuts during a recession. In 2012, I also underestimated state resilience (not everyone did). Back then it seemed that California, for example, would not, as a matter of politics, increase its state-level income and sales taxes and, even it could, I didn't think enough could be raised to right the ship. But California did raise its income tax twice, and in a progressive way, and the state currently has built up a significant rainy day fund. Without doubt, California still has fiscal challenges and it would be much better for the state to rely more on the property tax, but I was wrong to think that this was the only way forward. In short, I overestimated the problem to which my proposal was a solution. In any event, if the House plan were serious about reviving the property tax on fiscal federalism grounds, it would not proceed by means of preserving the deduction in the way that it does, especially in the context of a plan that also doubles the standard deduction. As an itemized deduction that is only worth anything beyond the new larger standard deduction, there is unlikely to be much shift in state or local political economy under the House plan. A way to achieve such a shift would be to make a portion of the property tax an above-the-line deduction, as it was briefly in 2008-09. Though still problematic for the reasons noted at the outset, that would at least represent a coherent - and less regressive - choice to advance a policy goal through advantaging the property tax. Needless to say, I do not expect this to happen. There have been numerous important discussions of how states might respond to the repeal of the SALT deduction. David Kamin lists some of them here; he also notes that these possible (likely?) responses should be taken into account by the JCT because they will reduce the revenue gains that the federal government is expecting. I should like to sketch out one additional state response. Suppose the House approach to the SALT deduction were to become law. This means that the deduction would be eliminated except for $10,000 in property taxes. A certain group of taxpayers will now find themselves with less than $10,000 in property taxes to deduct, but lots of state income taxes that they can no longer deduct. To be specific, suppose a taxpayer has $5,000 in property taxes that they can still deduct, but $8,000 in income taxes that they cannot. If $5,000 of the income tax liability could be shifted into the property tax then the taxpayer (and the state) would not be leaving a deduction on the table. This could be done, of course, just by increasing property taxes and reducing income taxes. As it turns out, even if increasing property taxes is on balance a good idea, it is one that is highly fraught politically and has big implications for state-local relations. Also, as the current experience with drive-by tax reform is continually illustrating, major changes to tax systems should not be done quickly. See here for some of the issues raised by a shift to property taxes. But a state with an income tax need not engage in a prolonged debate about increasing its property tax in order to maximize the value of the SALT deduction for its citizens. In broad strokes, all a state needs to do is formally increase its property taxes so that citizens can get the maximum deduction, but then in effect hold taxpayers harmless by means of the state's income tax. Here is what this might look like a little more specifically. The state can authorize its localities to impose a special property tax supplement up to $10,000 so as to assure all taxpayers maximize their SALT deduction (if they end up itemizing). Next, the state creates a generous property tax circuit breaker in its income tax. The circuit breaker could work like this: to the extent the property tax burden as a percentage of a taxpayer's income is greater than it was in 2017 - and that increase is a result of a special supplemental property tax - then that additional property tax is forgiven. To be sure, there would be many details to work out (such as coordinating the timing of local property tax collection with the state income tax), but I think the mechanism is sound. An additional refinement could be to make certain that some small portion of the new property tax is in fact collected by the locality so that the whole structure is respected. I should add that I believe that states (really localities) should increase their use of the property tax in general and that generous circuit breakers are an important way to make this possible. See my argument here. One would hope that the fact that this self-help proposal for the states is also a reasonable idea on its own would make it more attractive.